For a few weeks between terms I had the opportunity to take the new Kobo eReader for a test drive and put it through its paces. The Kobo device is a cheaper, slimmer, sleeker version of an Amazon Kindle being launched by the Canadian Company this spring. 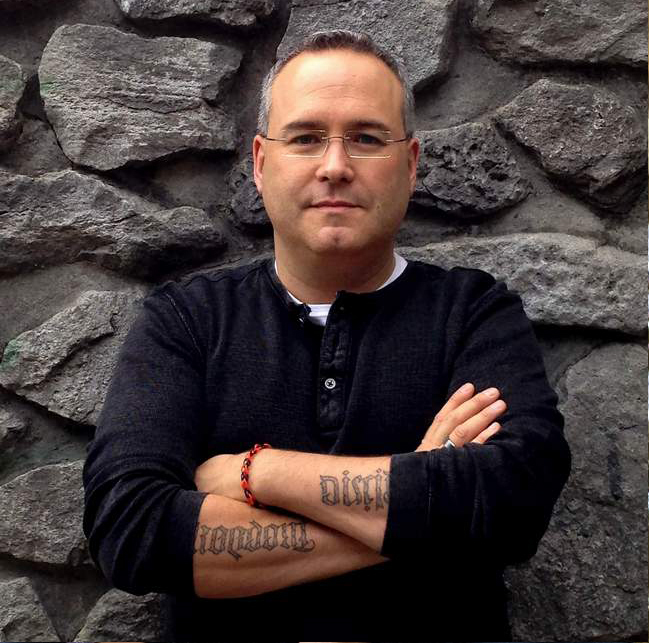 Set to hit markets in early May, Kobo is one of the largest retailers in the world as far as eBook productions go, supplying Chapters-Indigo in Canada, sales through Borders south of the border, and a large share of the Asian market. Kobo has been in the EPUb market for a few years now and supports an open format ebook that is purchasable and transferable to your devices. You can put your books on your Blackberry, Mac, PC, or nearly any other device. Now they have entered into the hardware market with a dedicated eBook reader. T he Kobo eReader comes in around 220g, comes in a variety of colors and different skins. It comes pre-loaded with 100 ebooks. 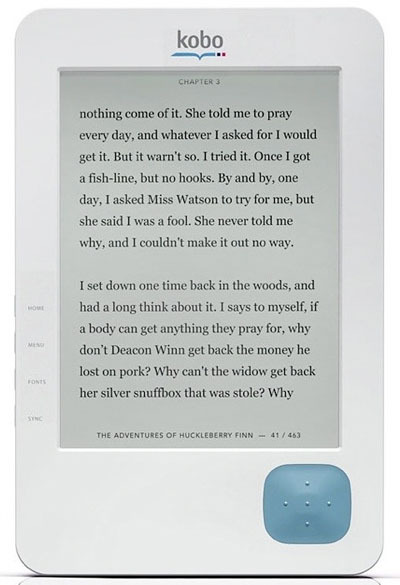 Their eReader has the lowest price tag on a dedicated eReader; it is intended to be an entry level device to get you hooked on the idea of ebooks. It is lighter, smaller and more versatile than most of its competitors. The Amazon kindle supports its dedicated format and PDF, but you must download via USB or 3G. The Sony readers support a slew of formats but only connect via USB. Over the last 10 years I have used a number of devices to read eBooks, and I confess I am a bibliophile and do love having real books made from paper in my hands, but this device was different. It was the first eReader I have used that I could picture myself using as a dedicated device, and as my primary reading source. I have used a few generations of the Sony eReaders, and for a few years used a Sony Clie as an eReader while riding the bus daily to and from UW. I have played with the Kindle and read books on the PC, laptop or tablet for years. In all of that experience I would have to say the most pleasurable was the Kobo. It was easy on the eyes, comfortable in the hand, and convenient to carry around. The quilted back made it much easier on the hands than any other eReader I have ever used. I held it for close to 8 hours straight the first night I had it, and read Christopher Moore's Bite Me on it in three sittings. During the time I had the demo model, I used it exclusively for reading, and let over 30 people play with it. They were all amazed at the functionality and ease of use. Combining it with Calibre software, I was able to convert some older eBooks I had and drop them on the device with no issues. The ability to re-size the font on the fly was nice. At one point I had been up over 20 hours and was waiting for a plane to arrive. Being tired, I bumped the font up a size and continued reading with less eye strain. The next morning bumped it back down and continued with the book. I had the device out of the box and in less than five minutes had installed the software (from the device) and synced some of my own eBooks for reading. 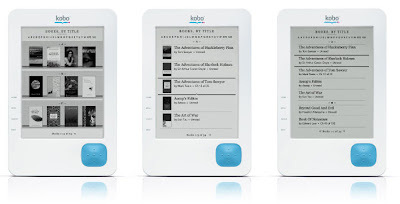 But even with all of that, are there some drawbacks to the Kobo? Yes, there are a few. It is only a 6-inch screen and the Kindle DX is a 9-inch screen. You cannot search your library, or sort it other than author or title. You cannot create sub-folders or groupings but the people at Kobo did mention this is under development. It does not have a dictionary or wi-fi so you cannot look up something immediately. It is a little slower at turning pages or opening your own ebooks over its native Kobo books, but not enough to be a hindrance. 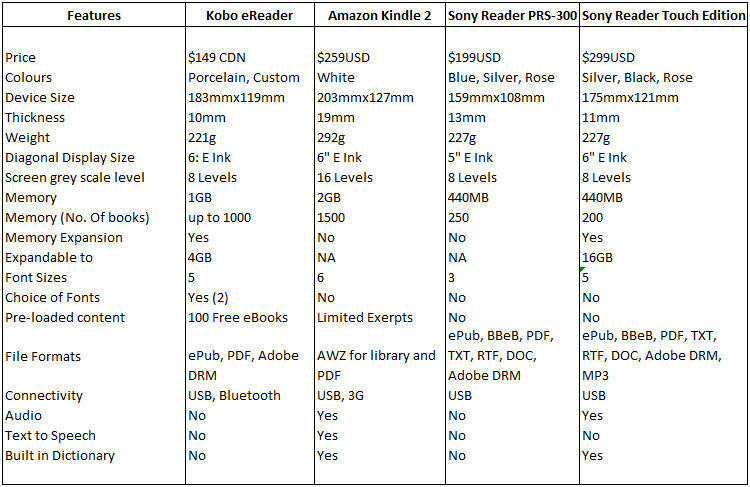 On the plus side, it is the cheapest of the eReaders on the market that use eInk technology. It is the most comfortable to hold and use. It is easy to manage the library and add or remove books. It is small, and light and fun to play with. There was not a person who tried it, that did not think it was not only functional, but at the price point, a great option. After playing with it for a few weeks am I converted? Maybe I could see myself going to it as my primary source for fiction reading. Could I see myself using it as my textbook? No. 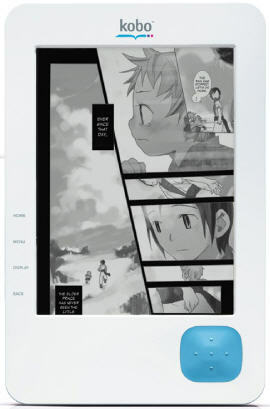 Some of the other features in other eReaders make them more promising for school. Do I want one? Definitely. As someone who works full-time in IT, I often have the opportunity to play with new technology, devices or applications. This eReader blew away my expectations. 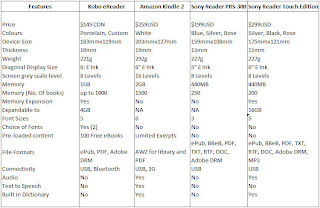 Note: I have written an updated head to head comparison between Kobo and Kindle 2011-05-06, you can read it here. Thanks for the comprehensive review. It's perfect, except for one minor flaw for some, but a major one for me. No dictionary?! That's a deal-breaker. If only it had that dictionary. Or do you think you can just load a dictionary? Can do you do that at least? You could load one, and just keep it as one of the works in progress. Just not a native search from document reading, that you have with a wireless device. Never had that issue. I would take it back or call tech support.